CALGARY – With the labour left and Christian right joining in passionate opposition, aldermen have spurned a proposed bylaw that would have limited public protests on the plaza and even sidewalks outside City Hall. "It seems like we’re trying to kill a mosquito with a sledgehammer," Ald. Jim Stevenson said. City officials were attempting to fill in a gap in its current rules that didn’t actually allow protests on City Hall property, but were unenforceable. They were trying to create rules that allowed an "appropriate" place to protest but still allow city workers and passersby to get around, and not hold the city liable for damage, a corporate properties director Sharon Purvis told a council committee today. The new bylaw would have created a designated "permit zone" on a small concrete rectangle in front of the downtown building where citizens could demonstrate or hold events if they applied for a permit five days in advance. Large impromptu protests or ones on the sidewalk ringing the municipal complex would have not been sanctioned, although they wouldn’t necessarily be broken up. Aldermen ordered city administration to overhaul the draft bylaw, and explain how it would respect the Charter of Rights and Freedoms. The proposal drew sharp criticism from both Concerned Christians Canada and the Calgary and District Labour Council, as well as a street pastor who holds weekly events on City Hall’s sidewalk and has run afoul of city officials for loudspeaker use. Ald. Druh Farrell questioned whether protests against gay rights might threaten city employees who are gay. Peggy Askin, the labour group’s former president, replied that governments shouldn’t use security concerns to curtail the rights of all Canadians to practice free speech and assembly. She also derided the notion of "protest pens." 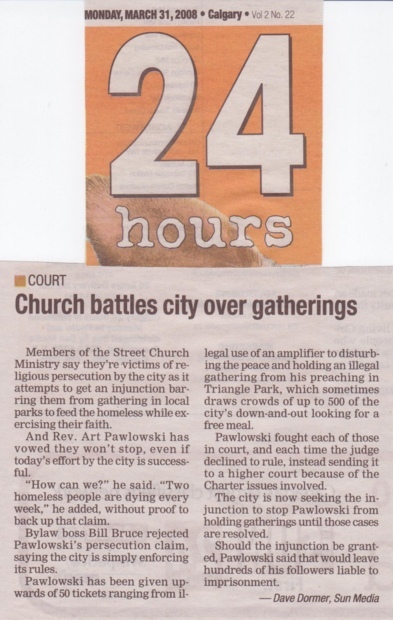 Susan Hearn, a supporter of the street ministry’s regular gatherings, also warned the city not to be heavy-handed with public expression. "You don’t have a right to rewrite the constitution," she said. This is the second time that city officials have been ordered to modify a draft bylaw for events and security on the municipal complex. Purvis and staff tried to address council’s past concerns by allowing spur-of-the-moment protests of fewer than six people without a permit — as long as there was advance notice. Union picketing would be exempted, as would amplification after working hours and the use of fire for religious ceremonies. ← I will respond to your questions and concerns.